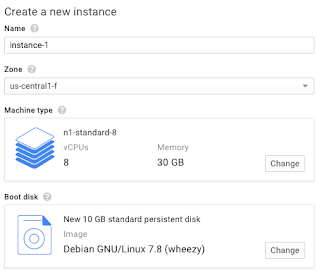 In this post I’ll summarize what I learned from running benchmark tests with the Aerospike team using Google Cloud Platform (GCP) virtual machines. In doing this work, I independently validated their latest benchmark test results of up to 4 Million Transactions Per Second (TPS) on a single Aerospike cluster. These results are significantly faster than the previous December 2014 benchmark, which showed 1 million write transactions per second with 50 servers and 1 million reads per second with 10 servers. 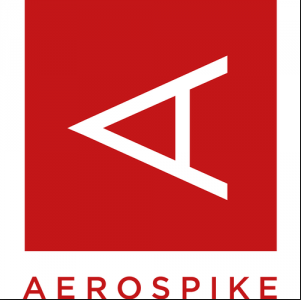 Aerospike is a powerful open source NoSQL database. It’s known for both speed and scale, and is often used for session storage, advertising profiles, recent financial transactions, caching and other fast key value uses. Aerospike is built to be extremely fast by leveraging SSDs for persistence and includes automatic scalability. It’s also multi-threaded and written in C.
In the December 2014 benchmark, a 1 million read per second configuration was quoted as $11.40 per hour (about $8300/month). With the configurations used in this updated performance test, 4 million reads per second required 20 n1-standard-8 instances at $0.304 per hour each ($4499.20/month). An improvement of four times the performance at half the price was measured. I reached out to Google and learned they profile their products and optimize their software regularly. The changes impacting Aerospike were a drastic reduction in network latency, achieved through a new interrupt handler, and huge pages support on the host OS. Changes to the host OS are not possible for customers, so having Google doing this regularly is a good thing. For the benchmark tests, I tested the most common use case – using Aerospike as a simple key-value store, using in-memory (DRAM) data storage with synchronous replication. Individual key-value requests are individual network transactions, and neither batching nor pipelining are used. I used Compute Engine VM’s for this test run and the steps to reproduce these results are included. In validating results, I found ease of implementation to be a key differentiator between Aerospike and other NoSQL databases for large-scale loads. This matched nicely with the speed, ease and scale of Compute Engine. For example, I was able to use default settings on Compute Engine instances – no manual tuning or special setup in GCP was required. Combine a blazingly fast cloud with a blindingly fast NoSQL database for powerful results. Aerospike handles the equivalent of sharding automatically. There’s no downtime. You can add new capacity (data volume and throughput) dynamically. Simply add additional nodes and Aerospike will automatically rebalance the data and traffic. You set the replication factor to 2 or more and configure Aerospike to operate with synchronous replication for immediate consistency and durability. 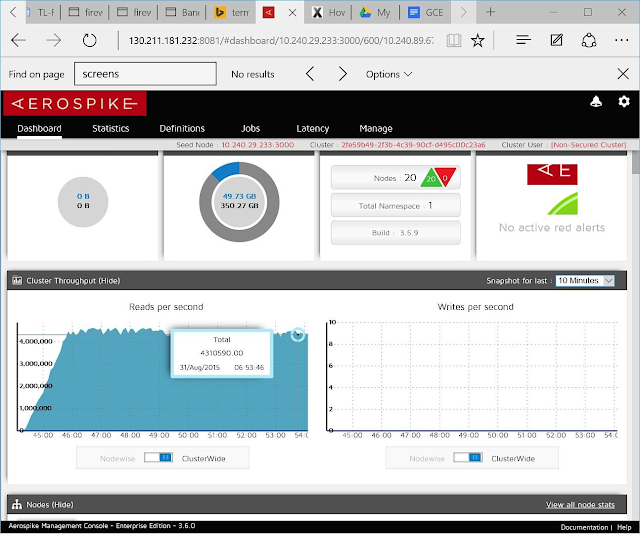 If a server goes down, Aerospike handles failover transparently; the Aerospike client makes sure that your application can read or write replicated data automatically. You can run purely in RAM, or take advantage of Flash/SSDs for storage. Using Flash/SSDs results in a slight penalty on latency (~0.1ms longer on average), but allows you to scale with significantly smaller clusters and at a fraction of the cost. One of the reasons I’ve been doing more and more Big Data project work on Compute Engine is due to its raw performance. As mentioned, I was pleasantly surprised at the lack of manual configuration I had to do to validate this benchmark. It was basically, ‘plug it in, turn it on…and go.’ I’ll cover details about the instance types and sizes in subsequent sections, but this lack of need to twist and turn obscure (cloud) knobs, is significant. This is because simplicity results not only in reproducibility, but also more importantly, general productivity. Your team can get started quickly and can then move on to other work, such as adding features to your solution, without having to spend time tweaking Compute Engine instance settings. That being said, I find that reproducing vendor benchmarks on any public cloud requires some attention to detail. The environment is obviously different than on premises. Also beyond basic setup, performance-tuning techniques vary from those I’ve used for on-premise and also from cloud-to-cloud solutions. In addition to covering the steps to do this, I’ve also included a list of technical links at the end of this blog post. These links include the Github repository with the complete script and config files that I used to run this series of tests. SETUP Compute Engine Environment. Best practice when testing is to properly setup a dedicated test environment. To do this on Compute Engine, sign in or create a user account (https://cloud.google.com/). Next access the GCP console and create a new GCP project. Note the project name. Then download and install the GCP SDK (https://cloud.google.com/sdk/); this will give you access to the gcloud command-line tool. Note: To replicate the 4 million TPS benchmark, you’ll need to enable project billing and then request an increase in the default quota limits for a GCP project, as you’ll need to increase the default CPUs/project limit from 24 to 160. 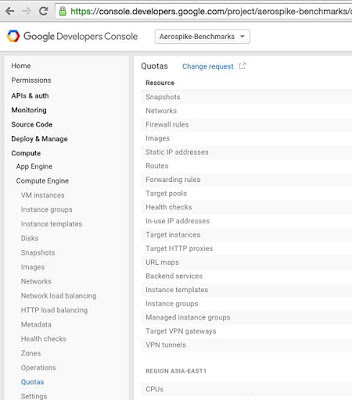 To do this, from within your new project in the GCP console > Compute > Compute Engine > Quotas and then click on the "Change Request" link at the top of the page. Fill out the form and click send. It generally takes around 24 hours for this type of request to be processed. SETUP Compute Engine instances for the Aerospike server cluster. We’ll start by setting up an Aerospike cluster that can handle 4 million TPS. You can, of course, reproduce this testing with the level of benchmark that is appropriate to your projected workload value. To reproduce the Aerospike team’s results, I used 20 GCE Linux instances for the server cluster. I used n1-standard-8 instances types. Each instance has 8 CPUs and 30 GB of memory. For each instance I used Google’s standard GCE Debian GNU/Linux boot disk version 7.8 (shown left). I selected this number of this type of instances because this configuration uses common instance types. 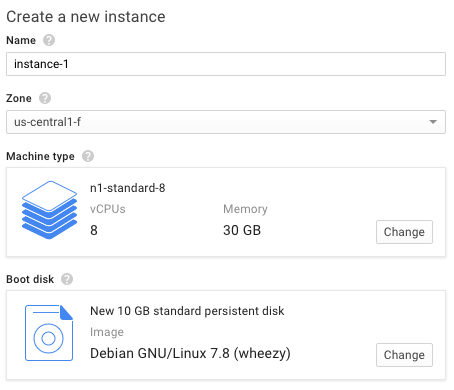 Additionally, I used the GCE image that the Aerospike team prepared as the base image for each node in my cluster, which is based on Google’s Debian image. This image contained a default installation of Aerospike server, Aerospike AMC (Aerospike Management Console) and the Aerospike Java client. 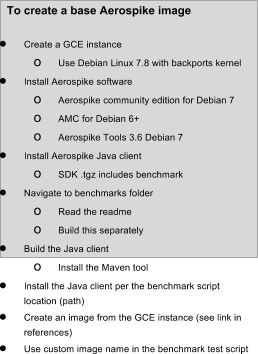 The Aerospike Java client includes the Aerospike benchmark-testing tool. I’ve included instructions on how to create this base image in the text box below. LOGIN to your Google Cloud account. Open a terminal window; create a working directory and cd into that directory. Set your account value and then use the gcloud auth login command to connect. SETUP variable values as for your test. Be sure to replace the (your-project-name) value with the name of your particular project instance. I set the value of "USE_PERSISTANT_DISK" to 0 to perform an in-memory only test. You could set it to "1" if you wished to test using persistent disks. CREATE 20 GCE instances for your Aerospike server cluster using the gcloud compute instances create command. I used a custom Aerospike image as a basis for creating each node. The full script can also create persistent disks if you choose to run your benchmark test with persistence. Note the use of the "tag" flag to identify these instances as the Aerospike server nodes. UPDATE the Aerospike config files. To create the cluster, update the Aerospike config files to use the correct IP address for the mesh address. (See the references section at the end of this post for a link to Aerospike configuration file that I used). You can use the default configuration file settings so long as your cluster uses 32 or fewer nodes. CREATE AEROSPIKE CLUSTER by booting the servers: Start the asd daemon on each server using the aerospike.config file. You run lines 64-74 to complete this task, also shown below. Start the AMC (GUI) Console: Although the Aerospike benchmark tool does generate text-based (log) output, I find that "seeing" the power via the Aerospike Management Console (GUI) is a fun part of testing. A portion of a sample AMC console is shown above. To connect to the AMC console, you’ll need to find the public IP of "as-server-1" and then open a browser using http://(public_IP_of_server-1):8081. Next you’ll enter the private (internal) IP in the dialog box that opens on top of the AMC as follows: http://(internal_IP_of_server-1):3000. You may need to create firewall rules to open these ports. 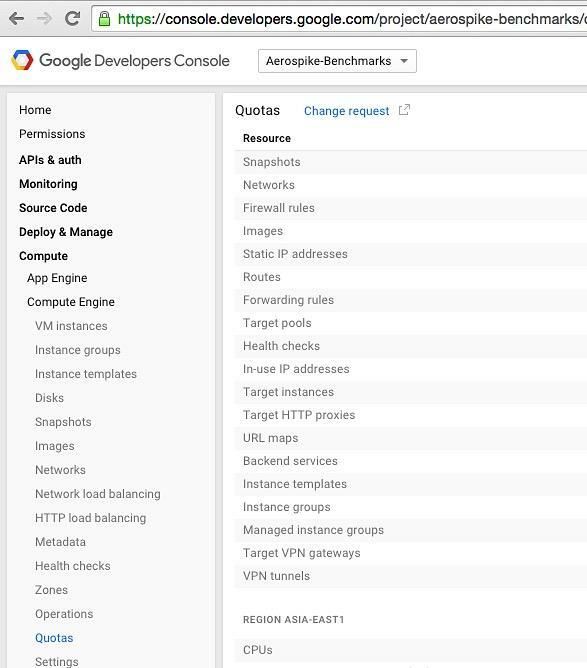 To do so, on the GCP console for your project, click on COMPUTE > Firewalls and then create the rules to open ports 3000 and 8081. 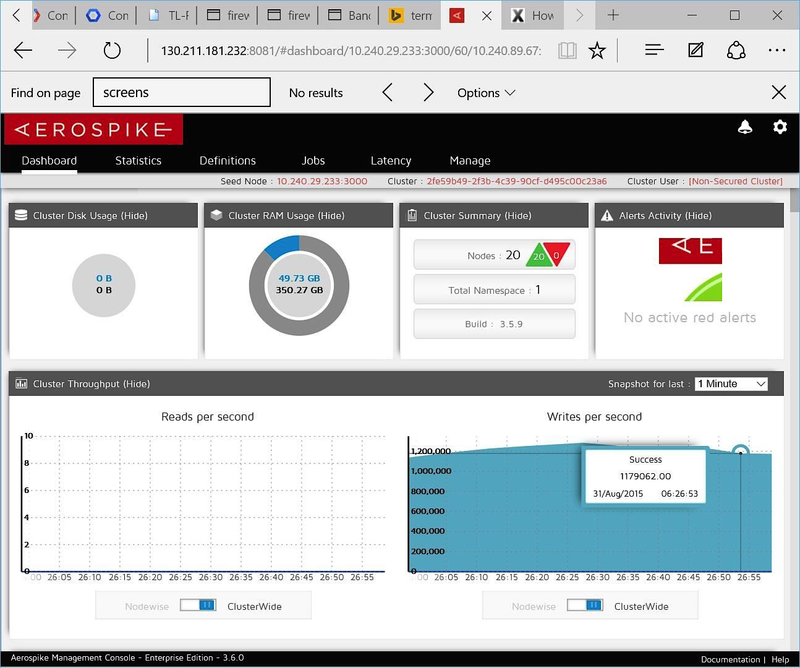 The Java client for Aerospike includes the Aerospike benchmark testing tools. Because we installed the Java client on our base image, all client instances include the benchmark tools – we simply need to “turn on the tool” to perform a load test. There are a number of parameters that you can use with the benchmark tool (detailed at the end of this section). To perform the test, I set the load parameters to 1 Million Keys and 256 client threads. Run the test. First l generated the load for the insert benchmark, and then I ran the test with a different load type. Shown below is the first result in the AMC – it’s actually considerably MORE than previous 1 Million TPS – it’s 4 Million! Of note is that only 50 GB (of the total available 350 GB) of RAM available to the cluster is being used for this workload. This first test uses 100% reads for the workload. For this next test, I ran the benchmark tool with the configuration set to 100% WRITES. This test resulted in a 1 Million TPS as shown in the AMC console image below. Again, of interest, is that only 50 GB (of the total 350 GB) or RAM is being used to run this workload. For each client instance, 256 threads give the maximum throughput in the in-memory database case (-z 256). When you’ve completed your testing, you’ll want to stop the test. You may also want to stop the Aerospike servers, delete disks and shutdown all VM instances. Run the referenced script from line 130 to the end (line 165) to stop the benchmark tests, stop all of the servers, delete all disks and shutdown all instances. In further work, I can see myself testing with different quantities of Compute Engine instances of different sizes. The key is to understand requirement and then test to validate, for example “can I run a workload of (n) speed with (n) number of servers, to further simplify management and thereby reduce overall cost?" Also, I could alter the test parameters to match whatever type(s) of real-world workloads I need. For example, I may test a common 80% read, 20% write mixed workload as client requests dictate in the future. Note: On Compute Engine Machine Types. I chose the n1-standard-8 series of instances, as these are “middle-of-the-road” instance types and provide a good instance-to-value ratio. Of course, Compute Engine offers a variety of instance sizes and types – a grid summarizing choices is shown below. Additionally, I'm curious about comparing the ease-of-setup between Compute and Container Engine for Aerospike. I’ll continue to work with the team to report on subsequent test results. Today’s guest bloggers are Lynn Langit – Independent Cloud and Big Data Architect named the Google Cloud Developer Expert for the past three years and recognized as an AWS Community Hero, Microsoft MVP (SQL Server), MongoDB Master and ACM Distinguished speaker – and David Haley, startup engineer and former Google Cloud team member who was the first engineer on the Google Cloud Platform Americas sales team.